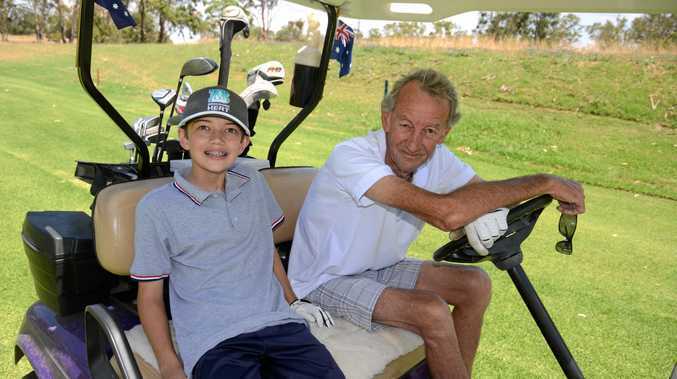 GOLF: At 12 years of age, Xavier Byrne is learning the game of golf with his grandfather. The pair play on a Sunday each fortnight and grandfather Bill Morrison is happy to pass on a few hints. Morrison has only been playing the game for six years after being talked into it by his brother Charlie Morrison. At present, Xavier is playing junior cricket on a Saturday but once the season is over, he is thinking of joining the junior golf program in Warwick. Grandfather and grandson have been playing for the past six months. "Xavier's is best at driving and his best shot is over the dam on the 13th to the front of the green,” Morrison said. Don't ask them for their score on a Sunday, they don't keep scores. It is all about having a go and being just a little better each week. Morrison was playing his second round of the weekend today after playing club competition on Saturday. "I went okay on Saturday but didn't break any records,” he said.